Following statutory authorization of an Aviation Section in the Signal Corps by the United States Congress in 1914, the Aeronautical Division continued as the primary organizational component of the section until April 1918, when its inefficiency in mobilizing for World War I caused the War Department to replace it with an organization independent of the Signal Corps that eventually became the foundation of the Army's Air Service. In 1898–99, the War Department accepted the report of an aeronautically-minded investigating committee that included Alexander Graham Bell and invested $50,000 for the rights to a heavier-than-air flying machine being developed by Samuel Pierpont Langley, Secretary of the Smithsonian Institution. Although Langley's "Aerodrome" failed embarrassingly, the Army later resumed its interest in aviation as a result of the success of the Wright Brothers and entered into protracted negotiations for an airplane. All balloon school activities of the U.S. Army Signal Corps were transferred to Fort Omaha, Nebraska, in 1905. In 1906, the commandant of the Signal School in Fort Leavenworth, Kansas, Major George O. Squier, studied aeronautical theory and lectured on the Wright flying machine. One of his instructors—Captain Billy Mitchell—was also a student of aviation and taught the use of reconnaissance balloons. Squier became executive officer to the Chief Signal Officer, Brigadier General James Allen, in July 1907, and immediately convinced Allen to create an aviation entity within the Signal Corps. The Aeronautical Division, Signal Corps, consisting at its inception of one officer and two enlisted men, began operation on August 1, 1907. Captain Charles deForest Chandler was named to head the new division, with Corporal Edward Ward and Private First Class Joseph E. Barrett as his assistants. [n 4] 1st Lt. Frank P. Lahm, a cavalry officer, was also detailed to the division and joined it September 17, 1907. Both Chandler and Lahm were balloonists. Lahm had earned renown the year before when he won the inaugural Gordon Bennett Cup, an international balloon event, while Chandler was already a member of the Aero Club of America. He remained head of the division until 1908, then again from 1911 to 1913. During the interim, he was relieved by Lahm and from May 1910 to June 1911 (while Chandler attended the Signal School Course at Fort Leavenworth) by Capt. Arthur S. Cowan, a former infantry officer and non-aviator assigned to the Signal School. On December 23, 1907, the Signal Corps issued Specification No. 486 for a heavier-than-air flying machine and requested bids. A copy of the specification was sent to the Wrights on January 3, 1908. The following April 30 Lahm and 1st Lt. Thomas E. Selfridge[n 5] reported to New York City along with civilian balloonist Leo Stevens to familiarize 25 members of the First Company, Signal Corps, a unit of the 71st New York Infantry, in the use of hydrogen-filled kite balloons. The company was organized to provide the New York National Guard with an "aeronautical corps" for balloon observation, commanded by Major Oscar Erlandean. In 1908, the Aeronautical Division, at the intercession of President Theodore Roosevelt in the acquisition process, purchased a nonrigid dirigible from Thomas Scott Baldwin for US$6,750 (equivalent to $188,225 in 2018), and an airplane from the Wright Brothers for US$25,000 (equivalent to $697,130 in 2018). Specification No. 486 required both types of aircraft be able to carry two persons. The dirigible had to be able to carry a load of 450 pounds (200 kg) and reach a speed of 20 miles per hour (32 km/h); the airplane's requirements were a load of 350 pounds (160 kg), a speed of 40 miles per hour (64 km/h), and a flying distance of at least 125 miles (201 km). The dirigible was delivered first, in July 1908, after Baldwin submitted an extremely low bid to ensure receiving the contract. Baldwin and Glenn Curtiss flew the test trials over Fort Myer and met all specifications except speed, which was just under the requirement. It was designated Signal Corps Dirigible No. 1. During August, Baldwin trained three officer candidates to fly the dirigible: Lahm, Selfridge, and 1st Lt. Benjamin Foulois, Infantry. Foulois was trained as the first dirigible pilot and prepared to move the ship from Fort Omaha to St. Joseph, Missouri, for a state fair exhibition. However, the first solo ascent in the dirigible, and the first flight solely by army pilots, did not occur until May 26, 1909. The Wright Brothers, who had been asking US$100,000 (equivalent to $2,788,519 in 2018) for their airplane, then agreed to sell a Wright Model A satisfying the requirements for $25,000 (they also received a US$5,000 (equivalent to $139,426 in 2018) bonus for exceeding the speed requirement). The airplane was delivered to Fort Myer, Virginia, on September 1, 1908, for trials. The first acceptance flight of the airplane was made on September 3 at Fort Myer, with Orville at the controls. Selfridge and Lahm were named official observers of the trials of the Wright aeroplane for September 1908. Both Lahm and Squier made acceptance flights as observers, and on September 13, Wright kept the airplane aloft for an hour and ten minutes. Orville Wright, along with Wilbur this time, returned to Fort Myer in June 1909 with a new though smaller and faster airplane, powered by the engine from the wrecked 1908 Flyer. The brothers spent the better part of July fine tuning the airplane and warming up for the final tests while bad flying weather hampered much of the month. For 1909's acceptance trials both Lahm and Foulois were named as official observers. Lahm flew with Wright on July 27, and on July 30, with President William H. Taft as a spectator, Foulois and Wright in the final acceptance trial made a cross country flight of 10 miles (16 km) around Shuter's (or Shooters) Hill between Fort Myer and Alexandria, Virginia. This flight broke all of the existing records for speed, duration with a passenger, and altitude with a passenger. Pleased with the performance of this airplane the Army purchased it awarding the Wrights US$25,000 (equivalent to $697,130 in 2018) plus an added bonus of US$5,000 (equivalent to $139,426 in 2018) ($1,000 for each mile achieved over 40 miles per hour (64 km/h)). The plane's best speed had been 45 miles per hour (72 km/h), bringing the total sale price to US$30,000 (equivalent to $836,556 in 2018). The Army accepted the Wright A Military Flyer on August 2, 1909, designating it "Signal Corps (S.C.) No. 1". On August 25, the Army leased 160 acres (0.65 km2) of land along the Baltimore and Ohio Railroad at College Park, Maryland, for use as a training field. The newly purchased airplane was delivered to College Park on October 7, assembled by Wilbur Wright, and flown for the first time the next day. Wright began instruction of Lahm and 2nd Lt Frederic E. Humphreys, detailed from the Corps of Engineers, flying constantly in front of often large crowds of curiosity seekers, newspaper reporters, and dignitaries. Both soloed on October 26, Humphreys going ahead of Lahm (the detachment commander) because it was his turn to fly. Although both flights were of less than 15 minutes in duration and 30 ft (9.1 m) of altitude, late in the day Lahm remained aloft for 40 minutes, telling Wright he landed only because it was suppertime. The Army's contract with the Wright Brothers ended with the completion of training of the two student pilots, and Wilbur Wright made his last public flight on November 2. Later that day, Lahm took Lieut. Sweet up as a passenger and he became the first naval officer to fly. The dirigible service proved short-lived, as the corrosive effects of weather and the hydrogen gas used to lift the ship caused the gasbag to leak with increasing severity. The dirigible was condemned and sold at auction. Foulois had been a vocal critic of the dirigible, recommending that it be abandoned, and although one of the two candidates selected to be trained as an airplane pilot, he was sent to Nancy, France instead as a delegate to the International Congress of Aeronautics. Foulois arrived back from France on October 23 and was given some preliminary flight time with Wilbur Wright, even though Wright was not contractually obligated to do so, with the intent that Humphreys would complete Foulois' training. In November 1909, Foulois became the only officer detailed to the Aeronautical Division. He accrued three hours and two minutes total flying time at College Park but did not solo. Because of inclement winter weather at College Park, Foulois was assigned to move the flying program to Fort Sam Houston, an Army post near San Antonio, Texas. Foulois and eight enlisted men[n 10] disassembled the still-damaged S.C. No. 1, shipped it to Texas in 17 crates, and reassembled it on February 23, 1910, after building a shed to house it on the Arthur MacArthur Field used for cavalry drill. On 2 March 1910, after training himself, Foulois logged his first solo from 9:30am to 9:37am and four flights in total, crashing the S.C. No. 1 on its final landing. He achieved a maximum altitude of 200 ft (61 m) and a speed of 50 mph (80 km/h) in logging 59 minutes and 30 seconds of flight time. He flew the repaired craft five times on March 12, and received written instruction by mail from the Wright Brothers. Until 1911, Foulois remained as the Army's sole aviator and innovator. He stated in annotating the aircraft's flight log that he installed a 4 ft (1.2 m) leather cinch strap from the Cavalry saddlery as a safety belt on the S.C. No. 1 on March 12, 1910, then on August 8 he and Oliver Simmons bolted wheels from a cultivator onto the landing skids to provide the first landing gear. S.C. No. 1 made its last flight, and the 66th on it by Foulois, on February 8, 1911. Squier, now Chief Signal Officer of the Maneuver Division, formed a provisional aero company on April 5, 1911, the first aviation unit in American history,[n 12] in anticipation of training 18 additional pilots. [n 13] Five new airplanes were authorized for purchase, and two were received at Fort Sam on April 20, a Curtiss 1911 "Type IV military aeroplane" (Curtiss Model D) designated Signal Corps No. 2, and a new Wright Model B that became S.C. No. 3. Both came equipped with wheels rather than skids, and the Curtiss aircraft was powered by an 8-cylinder, 60 hp (45 kW) engine in sharp contrast to the 40 hp (30 kW) 4-cylinder training engines the student pilots were accustomed to. Two civilian pilots, Frank Trenholm Coffyn of the Wright Company and Eugene Ely from Curtiss, arrived with the aircraft to assist in instruction. All three of the Army's aircraft took to the air at the same time on April 22, 1911, during a parade and review of troops of the Maneuver Division at Fort Sam Houston, captured in a panoramic photograph linked below. After Army acceptance of the aircraft on April 27, Foulois and Ely then undertook training a small group pilot candidates on the Curtiss machine, including three (Capt. Paul W. Beck, 2nd Lt. George E.M. Kelly, and 2nd Lt. John C. Walker, Jr.) who had been partially trained as prospective Curtiss instructors by Glen Curtiss at North Island, San Diego, California, before being ordered to Texas. Student pilots were divided into separate sections because the flight controls on the two types were markedly different and the single-seat Curtiss machines did not allow for dual instruction. S.C. No. 1, judged no longer airworthy due to many rebuilds, was retired from service on May 4 and sent to the Smithsonian Institution in October. While stationed in the Philippines in 1908, 2nd Lieutenant Henry H. Arnold assisted Capt. Arthur S. Cowan (then in the Infantry) in a military mapping detail. Cowan returned to the United States, transferred to the Signal Corps, and was assigned to recruit two lieutenants to become pilots. Cowan contacted Arnold, who cabled his interest in also transferring to the Signal Corps but heard nothing in reply for two years. In 1911, relocated to Fort Jay, New York, Arnold sent a request to transfer to the Signal Corps, and on April 21, 1911, received orders detailing him and 2nd Lt. Thomas D. Milling to Dayton, Ohio, for flight instruction at the Wright brothers' aviation school. [n 17] Beginning instruction on May 3, Milling had soloed on May 8 after two hours of flight time while Arnold made his first solo flight May 13 after three hours and forty-eight minutes of flying lessons. Milling won the Tri-State Biplane Race in a Wright B against a field of experienced fliers, flying a course from Boston, Massachusetts, to Nashua, New Hampshire, to Worcester, Massachusetts, to Providence, Rhode Island and back to Boston, a total of 175 miles, without the use of a compass. It was also his first night flight, with several large bonfires providing guidance to the landing field. Arnold accepted delivery of the Army's first tractor plane (with a propeller and engine mounted on the front) on June 26, 1912, but crashed into the bay at Plymouth, Massachusetts, during takeoff. Arnold began to develop a phobia about flying, intensified by the fatal crashes of the Wright Company instructor who taught him, Arthur L. Welsh on June 12, and an academy classmate of Arnold's, 2d Lt. Lewis Rockwell, on September 18, 1912, both in the new Wright C "speed scouts". In October 1912, Arnold and Milling were sent to Fort Riley, Kansas, to experiment with spotting for the field artillery. On November 5, Arnold's Wright C stalled, went into a spin, and he narrowly avoided a fatal crash. He immediately and voluntarily grounded himself, then returned to the Infantry in 1913 after closing down the school at College Park, which was discontinued in favor of one with favorable flying conditions year-round on North Island at San Diego, California, later named Rockwell Field in 1917 in memory of Arnold's classmate. Rules of the Fédération Aéronautique Internationale (FAI) were adopted, including standards for the certification of pilots, and Arnold and Milling became the first two Army pilots to be FAI certified. On February 23, 1912, the U.S. Army established its own military aviator rating and issued the first five (of 24) to Arnold, Chandler, Milling, Beck, and Foulois in July 1912. In February 1912, recognizing a need for specialized aircraft in field service, the Aeronautical Division drew up its first new specifications for aircraft since 1907, creating a "Scout" classification for a two-man, slow speed, tactical reconnaissance airplane; and "Speed Scout", for a lighter, faster, one-man airplane for strategic (longer ranged) reconnaissance. In May 1912, the division purchased its first Speed Scout, a Wright C. The aircraft crashed during its acceptance trials on June 11 at College Park, killing 2nd Lt. Leighton W. Hazelhurst, who had been among the first class of student pilots, and Arthur L. Welsh, the Wright Company instructor who had taught Arnold to fly. Arnold himself was flying a Wright C (S.C. No. 10) in November 1912 at Fort Riley, Kansas, when he was nearly killed. [n 26] In total the division purchased six Wright Cs (not including the one flown by Welsh and Hazelhurst) and a Burgess Model J (a Wright C made under license), six of which crashed. This led to the grounding on February 24, 1914, of all "pusher" aircraft, including the sole Wright C survivor and a Burgess model rebuilt to Wright C standard. While at Texas City, the junior pilots complained directly about safety concerns to new Chief Signal Officer Brig. Gen. George P. Scriven, who had come to Texas on an inspection trip after reading adverse newspaper reports on the squadron, in effect delivering an ultimatum to Scriven that either Chandler be replaced or they would withdraw from aviation. Despite calling the incident an "incipient mutiny", Scriven relieved Chandler on April 1 and transferred him to Fort McKinley in the Philippines, replaced on an interim basis by Cowan, who was already in Texas City as the signal officer of the mobilizing 2d Division. [n 28] In September, Lt. Col. Samuel Reber—a former balloonist and influential member of the Aero Club of America—became the new head of the Aeronautical Division. [n 29] Both Cowan and Reber were non-aviators, causing further friction with the pilots and creating a permanent consensus among them that only an aviator was qualified to command flying units. When the 1st Aero Squadron joined the Curtiss airplanes at North Island in June,[n 30] Reber made Cowan commandant of the Aviation School at North Island, deepening the divisions. The United States landed Marines and armed Bluejackets in the Mexican city of Veracruz on April 21, 1914. By April 24 they had completely occupied the city after severe fighting and were provided reconnaissance support by five Navy seaplanes assigned to the United States Atlantic Fleet. Two days later, to reinforce the Navy's aviation detachment, Foulois and four pilots of the 1st Aero Squadron, soon designated the squadron's 1st Company, crated their three Burgess H tractors and shipped them by rail to Fort Crockett at Galveston, leaving only two aircraft and five pilots in San Diego. 1st Company was itself reinforced by six new pilots but never uncrated their airplanes and left Texas on July 13, 1914. Beck was possibly the first advocate of an air service separate from the Army ground forces. In 1912 Beck authored an article for the Infantry Journal entitled, "Military Aviation in America: Its Needs," promoting the concept of an independent air force with its own missions. After he returned to the Infantry, he continued to lobby friends in Congress to return to aviation. In February 1913, Representative James Hay (Democrat-Virginia) introduced a bill intended to transfer aviation from the Signal Corps to the line of the Army as a semi-autonomous "Air Corps". The bill was considered too radical and died in committee, but when the 1913 appropriations bill included many of its provisions, Hay offered a revised bill in May, HR5304 "An Act to Increase the Efficiency in the Aviation Service". Hearings were held on the new bill in August 1913. Beck appeared to testify on behalf of the bill, the only officer to do so, and was opposed by Major Billy Mitchell, representing the General Staff, and Foulois, Arnold, and Milling representing the Signal Corps. That bill had its original language expunged and was written to become the enabling legislation for the Aviation Section, Signal Corps on 18 July 1914. Appropriations for aviation fell to $100,000, in part because the Signal Corps had spent only $40,000 of the Fiscal Year 1912 funding. However, as a result of the high number of fatalities, flight pay (35% increase above base pay) and accelerated promotion for pilots were approved by Congress on March 3, 1913, in the appropriations legislation and the Aeronautical Division grew from 14 to 18 pilots. The Army Air Forces Statistical Digest (World War II) listed the strength of the division at 51 officers and men on November 1, 1912, and 114 on September 30, 1913. Statistics compiled for the HR5304 hearings showed that United States ranked 14th in expenditures among the nations with air services. In the following year, Congress increased the size and prestige of Signal Corps aviation when it established the Aviation Section, with the Aeronautical Division continued as its headquarters component issuing orders in the name of the Chief Signal Officer. Reber became chief of the section and was promoted to lieutenant colonel, delegating the duties of head of the Aeronautical Division to another non-aviator, Major Edgar Russel, senior instructor and assistant commandant of the Signal School. [n 31] In February 1917 the Aeronautical Division was one of three divisions in the Office of the Chief Signal Officer (OCSO) comprising the Aviation Section, the others being the Administrative Division and Engineering Division. On October 1, 1917, during World War I, the Aeronautical Division was renamed the Air Division and was abolished altogether by the War Department on April 24, 1918. SOURCES: Hennessy, The United States Army Air Arm, April 1861 to April 1917, Chapters 2–6, pp. 28–102; Warnock, "From Infant Technology to Obsolescence: the Wright Brothers' Airplane in the U.S. Army Signal Corps, 1905–1915"
The executive head of the Aeronautical Division had no official title between 1907 and 1914 but was usually referred to as the Officer in Charge (OIC). The history of assignments of heads of the division in official orders is murky and confused between 1908 and 1916. The four recognized by the USAF as the OICs of the Division during this period, and thus as "head" of its progenitor arm, are denoted by a bullet point. All others are on lists in official studies published by the Office of Air Force History or its successor AFHRA. After July 18, 1914, the division was a part of an aviation section authorized by statute, with a Chief of Division who as head of the headquarters component also exercised control of the section. *The Air Force does not acknowledge Lahm as OIC of the Aeronautical Division between 1908 and 1910. However, Chandler's biography and Hennessy's history (page 14) indicate that from May 1908 to July 1910 Chandler was commander of the Signal Corps Balloon Station at Fort Omaha, Nebraska. Also, Lahm was mandatorily returned to the Cavalry in late 1909, and no replacement is given, although if one was assigned, it was likely Foulois. **Chandler was also Chief of the Aviation School and commander of the 1st Provisional Aero Squadron when those organizations were active. He was relieved of duty on April 1, 1913, and transferred to the Philippines. Capt. Cowan replaced him in command of the 1st Aero Squadron and as acting OIC of the Aeronautical Division. ^ S.C. No. 30, a Curtiss J, was to have been the 31st aircraft, but although ordered at the same time as S.C. No. 29, was not delivered until September. 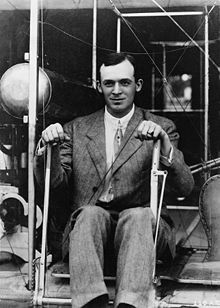 ^ 31-year-old George Cook Sweet was not a prospective aviator but an expert in the new field of wireless telegraphy. The Washington Post, reporting Creecy's suicide in 1930, stated that he lost his place on the flight in a coin toss with the Selfridge. This assertion, possibly a family anecdote, is unsubstantiated by any other source. ^ Selfridge had nearly been killed the previous December 6 in the crash of one of Bell's kites, AEA Cygnet, at the end of a test flight. ^ In May 1908, 25 members of the 1st Signal Company, New York National Guard, formed an unofficial balloon unit ("aeronautical corps") instructed by Lahm, Selfridge, and civilian balloonist Albert Stevens. By 1910 it had acquired a home-made aircraft using private funds and transported it to summer maneuvers, but it was not flown. The aircraft was destroyed in a crash but another was acquired which did fly in the 1912 summer maneuvers. This group sometimes referred to itself as the "1st Aero Company" but was never authorized or officially recognized. In November 1915 it was officially authorized by the governor of New York. ^ S.C. No. 2, the Curtiss D in which Lt. Kelly was killed, was not returned to service until July 25, after its engine had been swapped with a less powerful one from the new Curtiss Model E, S.C. 6 (Cameron, p. 44). ^ The "Detached Service Law," familiarly known in the Army as the "Manchu Law," was a provision of the Army appropriations act passed by Congress on 24 August 1912 that required a Detached Officers List be kept by the Army to enforce its regulation limiting the amount of time an officer could spend away from the organization in which he was commissioned. Prior to passage of the act, detached service was limited by policy, using a regulation created and enforced by War Department General Order No. 68 (26 May 1911), issued in response to criticism of the forming of a General Staff in 1903, which many philosophically opposed in a standing army. The regulation was also intended to curb favoritism shown in embassy and other "soft living" assignments perceived as "homesteading," and affected many Army agencies and all aviation officers except those permanently assigned to the Signal Corps. The regulation varied in wording from year to year but all variations stressed that at least one-third of an officer's time in service be spent with a "troop unit." Regulations in succeeding years tended to be more complex and legalistic as challenges to the policy grew in the officer ranks, and after 1914, included all officers in the grade of colonel or lower. The regulation required an officer to serve troop duty in his "arm of the service" (branch) for at least two years in any six-year period. Leave, illness, and travel time did not count towards the two required years. The Manchu Law was rigorously enforced by the General Staff and was much hated by the field forces. It was suspended during World War I and repealed by the National Defense Act of 1920. The term arose in usage comparing staff officers sent back to their regiments to bureaucrats of the Manchu dynasty ousted by revolution in China at the same time. In Beck's instance, the applicable regulation was "Article VI 'Details', Paragraph 40, Regulations for the army of the United States, 1910. ^ A third school was established at Fort Kamehameha in Hawaii by 1st Lt. Harold Geiger in July 1913, using S.C. 8 and 21, but trained no students after preliminary flying was suspended in September because of treacherous winds. The aircraft went into storage in November. The following year the engines were shipped back to the United States, Geiger and his detachment were sent home, and the two aircraft were sold at auction for a combined total of $450. ^ S.C. No. 10 crashed on February 9, 1914, killing 1st Lt. Henry B. Post. ^ The term "squadron" was derived from cavalry terminology and was used by early military air organizations internationally. In 1913, Chief Signal Officer Scriven testified during the HR5304 hearings before Congress that "the aeroplane is an adjunct to the cavalry." When the time came to form a tactical aviation organization, planners adapted the cavalry squadron organization to their purposes. Like cavalry squadrons, the new aero squadrons were administrative and tactical units, which usually consisted of two or more elements. In England, the Royal Flying Corps formed the first two aero squadrons in May 1912. The US Army followed the British example. ^ Reber had arranged for the first firing of a weapon (a rifle) from a flying airplane by Lt. Jacob E. Fickel on August 20, 1910. ^ Russel eventually became Chief Signal Officer of the AEF during World War I and a major general. Russel Hall, the headquarters building at Fort Monmouth, is named for him. ^ The manufacturers delivered 32 airplanes, but two crashed before acceptance. One (the Wright C Scout S.C. 10) was assigned a number before acceptance that was duplicated by its replacement, but the other, the Burgess F intended to be S.C. No. 5, was not. The leased Collier Model B was not assigned an SC number. As noted earlier, S.C. No. 30 was not delivered until after creation of the Aviation Section. ^ S.C. 19 and 20 were experimental Wright D Speed Scouts never placed in service after flight acceptance flights. ^ If Arnold were officially recognized, he would have twice commanded U.S. military aviation, once as a second lieutenant and once as a general of the army. ^ Dade, a colonel of cavalry, became school commander of the Signal Corps Aviation School on April 11, 1917, when Col. William A. Glassford reached the mandatory retirement age of 64. Glassford had purchased the General Myer and commanded the first Signal Corps War Balloon Company in 1894 at Fort Logan. Dade was promoted to temporary general of the Signal Corps on December 17, with a date of rank of October 29, and appointed to command the Air Division, and by seniority, the Aviation Section. ^ Hennessy 1958, p. 217, Appendix 1. ^ a b c d e Allen, Catherine Wallace (2002). "Wright Military Training at College Park in 1909" (PDF). Air Power History (Winter). Retrieved 13 Sep 2011. ^ a b Correll, "The First of the Force", p.48. ^ Correll, "The First of the Force", p. 49. ^ Miller, Roger G. (2002). ""Kept Alive by the Postman": The Wright Brothers and 1st Lt. Benjamin D. Foulois at Fort Sam Houston in 1910" (PDF). Air Power History (January). Retrieved 13 Sep 2011. ^ Pool (1955), p. 360. ^ Correll, "The First of the Force," p. 49. ^ "Leighton Wilson Hazelhurst, Jr". Arlington National Cemetery. Retrieved 2011-08-25. ^ Table 3, "AAF Military personnel—number and percent of US Army strength"
^ a b c Craig, Lt. Gen. Howard A. (Fall 1973). "Col. Charles DeForest Chandler, Air Service, U.S. Army". Journal of the American Aviation Historical Society. 18 (3): 197. ^ a b Maurer (1983), p. 14. Allen, Catherine Wallace (2002). "Wright Military Training at College Park in 1909" (PDF). Air Power History (Winter). Retrieved 13 Sep 2011. Greely, Gen. Adolphus W. (1900). "Balloons in War", Harper's Monthly Magazine, CI (DCI), pp. 33–50. Greer, Thomas H. (1985). USAF Historical Study 89, The Development of Air Doctrine in the Army Air Arm, 1917–1941 (PDF). Maxwell Air Force Base: Center For Air Force History. ISBN 0-912799-25-0. OCLC 12558056. Archived from the original (PDF) on 2013-03-13. Retrieved 10 Nov 2010. Lienhard, John H., Inventing the Air Force, "The Engines of Our Ingenuity" Episode 1974. Machoian, Major Ronald G. (USAF) (2002). "Looking Skyward: The Emergence of an Airminded Culture in the U.S. Army". USAF: Air University, Maxwell AFB. Retrieved 2012-05-29. Maurer, Maurer (1983). Air Force Combat Units of World War II, Office of Air Force History, ISBN 0-912799-02-1 "Introduction"
McClendon, R. Earl (1996). Autonomy of the Air Arm (PDF). Maxwell Air Force Base, Alabama: Air University. ISBN 0-16-045510-3. Retrieved 2012-05-31. McFarland, Stephen L. (1997). A Concise History of the U.S. Air Force . Ft. Belvoir: Defense Technical Information Center. ISBN 0-16-049208-4. Miller, Roger G. (2002). ""Kept Alive by the Postman": The Wright Brothers and 1st Lt. Benjamin D. Foulois at Fort Sam Houston in 1910" (PDF). Air Power History (Winter). Retrieved 13 Sep 2011. Pool, William C. (1955). "The Origin of Military Aviation in Texas, 1910–1913". The Southwestern Historical Quarterly. LVIII (January): 342–371. Retrieved 6 Sep 2011. —-- (1956). "Military Aviation in Texas, 1913–1917". The Southwestern Historical Quarterly. LIX (April): 429–454. Retrieved 6 Sep 2011. Raines, Rebecca Robbins (1996). Getting the Message Through: A Branch History of the U.S. Army Signal Corps. Washington, D.C.: Center For Military History. Retrieved 2012-06-02. Squier, George Owen (1908). "The Present Status of Military Aeronautics". Annual Report of the Board of Regents of the Smithsonian Institution: 132–133. Retrieved 2009-08-07. Tillman, Stephen L. (2010) . Man Unafraid. Washington D.C.: Army Times Publishing. ISBN 978-1-162-98799-6. Warnock, Dr. A. Timothy (2002). "From Infant technology to Obsolescence: the Wright Brothers' Airplane in the U.S. Army Signal Corps, 1905–1915". Air Power History (Winter). Retrieved 14 Sep 2011.